Pour olive oil in large saucepan, brown ground beef over medium high heat. Add onion and garlic. Cook until onion is soft, about 5 minutes. Add marinara sauce and water. Bring to a boil then turn down to simmer and add beans. Add cumin and chili powder. Add salt and pepper to taste and simmer until mixture thickens. Add hot sauce to taste. 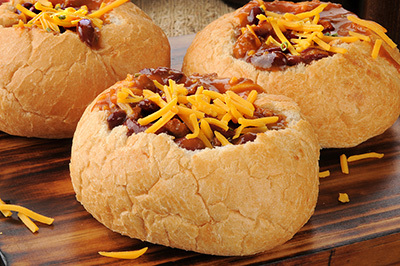 Serve in sourdough bread bowls. Top with grated sharp cheddar cheese and chopped fresh onion.